After moving from The Stables, back in February, clients have now settled into the new surroundings at The Annex. Parking, location and facilities here seem to be meeting with ongoing approval. The afternoons are an unexpected delight – been bathed in all colours of the rainbow as the sunlight hits the windows. The peacefulness away from traffic and crowds, allows you to chill completely and very much appreciated by you. The Christmas displays of gifts are now in stock and free gift-wrapping is on offer complete with gift tag – all you need to do is write it! For every £10 spent on products / Gift Vouchers, gains entry into the Free Christmas Raffle. Some lucky winner will receive the personal delivery of a Jill Yvette Goodie Hamper worth over £100! 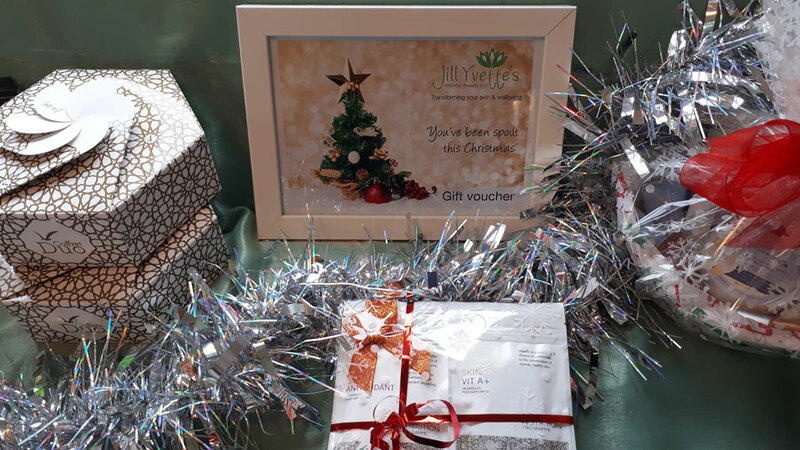 The new Christmas and General Gift Voucher designs are popular, and some clients are adding them to their selection of hamper goodies. Jane Iredale have some beautiful vanity bags, or foundation gifts. Gernetic have the very popular Synchro Duo offers saving 40% on some, and also introduced a new gift to the collection – for the luxury Parfait anti-ageing range. Advanced Nutrition Programme, offer a great solution to all that stress and tiredness taking its toll on your skin and mind at this time of year. Spa Find once again offering amazing Christmas gift boxes for face and body with some been nearly half the price of individual items. The smaller travel sizes are useful additions as smaller gifts for the tree, secret santas etc, or combined into organza bags for example. Mail orders are available – payment by phone. Open late until 8pm Thursday and Friday evenings now until 21st December. So call in, in the evenings between 6.30 and 8pm, for a browse – or to collect pre-orders.